Balzac, AB – As the holiday shopping season kicks into higher gear New Horizon Mall announced today its Top Ten Global Gift Ideas. With 45 stores now open, the Top Ten list was compiled from more than 5000 products currently available at the mall. New Horizon Mall is not a typical mall. It is a culturally diverse shopping experience featuring independent businesses with stores and products from all over the world. This year’s Top Ten list offers unique gift ideas for even the hardest to shop for. 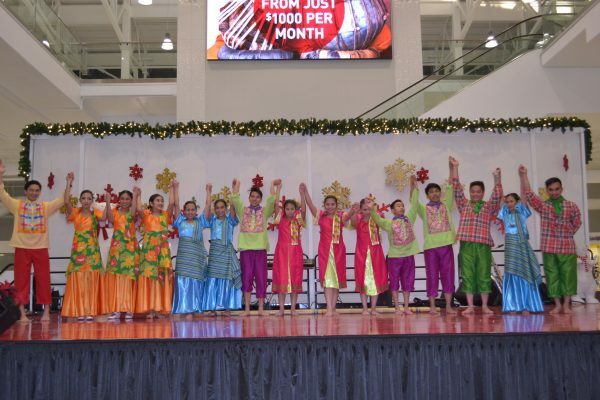 Photo Caption: Binhi Ng Lahi Philippine Folk Dance Troup performing at one of New Horizon Mall’s weekly holiday events. ERKE Shoes – ERKE is a popular Chinese sportswear brand that sponsors many Chinese Olympic Athletes. Just Juniors is the only retail location in Alberta that carries the brand, and one of only two locations in Canada. WHAMISA Korean Skin Care Products – Koreana B&H has this popular Korean skin care product line that is certified organic and only found in one other retail location in Canada. Koreana B&H also carries a wide range of supplements and other Korean products. Yerba Mate and Ayurvedic Tea – For the Tea Aficionado in the family, Vedicteas is a must stop this holiday season. This unique shop carries more than 105 different varieties of teas imported from around the world and blended locally. Philpott’s Honey – Looking for something sweet for your sweetie? Although this isn’t a global selection, Honey Vista offers a wide selection of Alberta honey products. Hand-Crafted Asian and Australian Terrariums – Building on trends down under in home decor, Earth Dreamz offers custom made terrariums featuring low maintenance succulent plants. Mobile Phone Telephoto Lenses – For the shutterbug or next Instagram star in the family Zeek’s Gizmoz and Gadgets carries a wide selection of mobile phone photography accessories. Board Games Galore – From Ticket to Ride to Settlers of Catan, BoardGames4Us has it all. Shoppers can try before buying in the adjoined games room at New Horizon. The shop has an extensive list of games, instore and through its online catalogue. Jiber Turkish Undergarments – Silk Road Importers carries a full line of Jiber undergarments for men and women. East Indian Bangles – Find a wide selection of bangles and other jewelry imported from India at Shreeji Jewelry. 10. Clothing and Accessories – A trip to the mall wouldn’t be complete without clothing and accessories. Check out Penny’s Accessories for hair pieces and fashion jewelry for girls and women. Shoppers can now enjoy authentic Asian fusion cuisine at Matty’s Grill or a rolled ice cream treat from Frollies Ice cream or they can try out some Filipino snacks from J and E convenience. Coming soon are Sharetea and Wow Bakery, that features Japanese and Korean baked goods. The number of stores at New Horizon nearly doubled since early November, and is now at 45 open now with an additional 40 opening in the next 2 months. The unique shopping experience at New Horizon Mall is highlighted by the welcoming and warm shopkeepers who are eager to share their stories and the stories behind their hand selected products. Each weekend this month, New Horizon Mall is hosting a Christmas Craft and Farmers Market in the atrium. This offers entrepreneurs and vendors the opportunity to be part of the holiday retail environment. Shoppers seeking out Boxing Day deals or gifts they didn’t receive, should have New Horizon on their visit list. With new stores opening weekly, gifts from around world are all under one roof at New Horizon Mall. New Horizon Mall is located 20 minutes north of downtown Calgary and directly across from CrossIron Mills in Rocky View County. The mall is comprised of unique stores, an entertainment stage and a food court with 300-seats plus indoor and outdoor parking areas. New Horizon Mall’s visionary retail experience, proven in major markets throughout the world, offers the exotic colourful allure of an international mall set in the comfort and beauty of a sublime, contemporary upscale architectural masterpiece.